Large teak outdoor set, from 2000. Table with 2 leaves Eight chairs (2 arm) Coffee table chaise longue Settee Two armchairs. 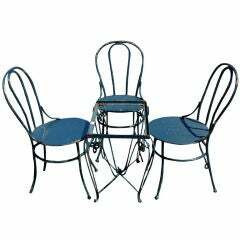 A set of outdoor furniture consisting of a table and two chairs. The glass insert top is not included. The table measures 22" x 14" x 20" high.